Part V: Adding Views for Displaying the Application. 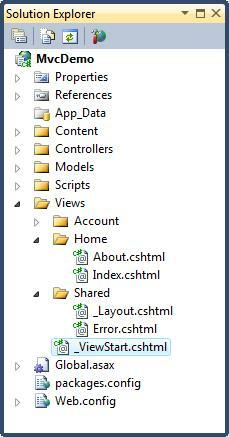 Visual Web Developer has created an Account folder, a Home folder, and a Shared folder (inside the Views folder). 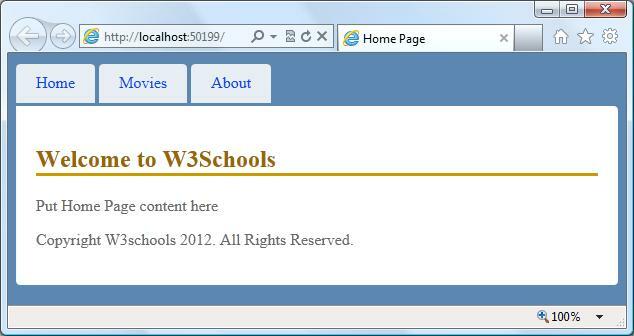 The Home folder is used for storing application pages like the home page and the about page. The file Index.cshtml represents the Home page of the application. It is the application's default file (index file). The file About.cshtml represent the About page of the application. Click on the "Home" tab and the "About" tab to see how it works. Congratulations. You have created your first MVC Application. Note: You cannot click on the "Movies" tab yet. We will add code for the "Movies" tab in the next chapters of this tutorial.